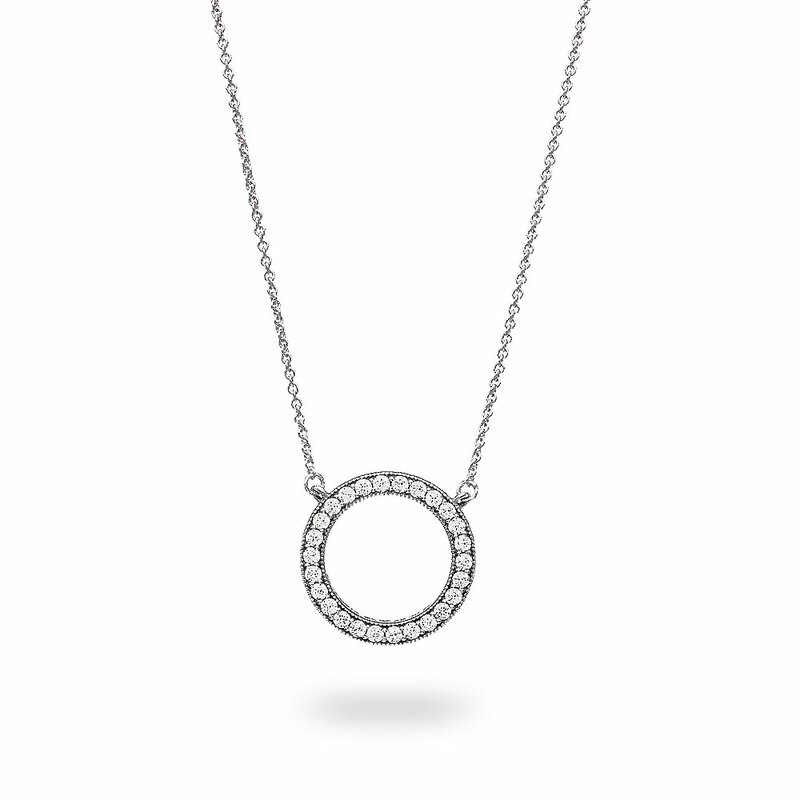 This PANDORA pendant necklace features a delicate silver chain and zirconia accented circular pendant and PANDORA engraving. Buy online or in store. Hearts of PANDORA Collier Necklace is rated 4.6 out of 5 by 31. Rated 5 out of 5 by Donna in South Dakota from Perfect Size I purchased this item for myself......and I'm glad I did! Just the right size for day or evening wear....looks great alone or layered....adjusts to multilple lengths which is a nice plus as well! I'm ordering a second one for my daughter for her 37th Birthday! Rated 4 out of 5 by Diazsunny 1 from Its beautiful and brilliant. It was a gift to me.I simply love it. Love sterling silver. Rated 4 out of 5 by Miche from Great Buy I got this necklace for Christmas and I Love it. I wish that the chain was longer, i brought in extenstion. Rated 5 out of 5 by Yumy from Beautiful Simple & Elegant you can wear everyday! Love it!!! Rated 5 out of 5 by Energizer_Max from Beautiful! Beautiful necklace. I love it and wear it every day! Rated 5 out of 5 by Lisa G from So beautiful I bought this for my daughter and she loves it. It is so beautiful. Rated 5 out of 5 by JOEY MOON from Love it! I bought this for my mom on mothers day and she loves it so much. It also came with a free jewelry box and she loves that as well. Its very shiny and pretty well worth the price!